Security Onion class is 1 week away! Please note that /var/www/squert/.inc/config.php gets overwritten during the update process so if you had previously set sgUser and sgPass to enable transcripts and event classification, you'll need to re-apply those settings. Timestamps are displayed in UTC by default, but you can change this by clicking the arrows to the right of the timeline. De-select UTC, then specify your local timezone offset. Then click "Save" to save your preference into the database and click "Update" to refresh the page with the new timestamps. See the "Time Selection" screenshot below. The securityonion-sostat package now includes a new script called sostat-redacted which runs sostat and pipes the output to sed, redacting any IPv4 addresses. When you need help from our mailing list and we request that you send redacted sostat output, you can now use sostat-redacted to automatically redact the IPv4 addresses (although there may be additional sensitive info that you still need to redact). Thanks to Steve Fennell for the suggestion! I've packaged Suricata 1.4.6 and the new package has been tested by David Zawdie and JP Bourget. Update suricata.yaml file(s) and then run "sudo nsm_sensor_ps-restart --only-snort-alert"
New versions of the following packages are now available! When running Setup and choosing Advanced Setup, you can now specify netsniff-ng's ring buffer size. When running Setup and choosing Advanced Setup, you can now enable mmap I/O for netsniff-ng. /etc/cron.d/sensor-newday was doing "syslog-ng reload" which was causing a memory leak. It now does a full "syslog-ng restart" to avoid the memory leak. While Setup is running, you can monitor /tmp/sosetup.log. After Setup has completed, you can find the log at /var/log/nsm/sosetup.log. Each sensor will now have its own argus.conf at /etc/nsm/HOSTNAME-INTERFACE/argus.conf that you can use to customize your Argus configuration. 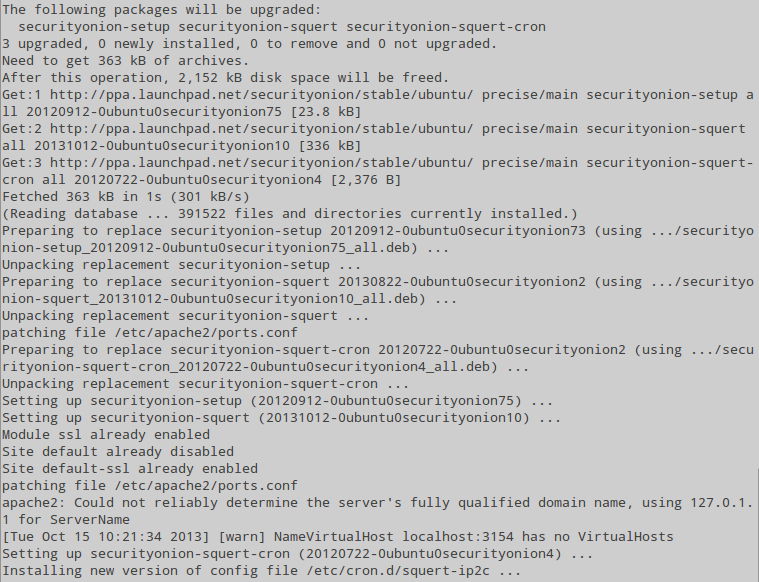 The default ossec_agent.conf had DAEMON set to 1, but our NSM scripts expect spawned processes to NOT daemonize. The NSM scripts now set DAEMON to 0 in ossec_agent.conf to avoid this. Thanks to Jon Schipp for his work on the netsniff-ng configuration! Thanks to David Edelman for his work on the Argus configuration! Thanks to JP Bourget and David Zawdie for testing the new packages! If you currently don't have the kind of DNS visibility described above or are unable to effectively search your DNS logs for anomalies, get Security Onion today! I just published a quick video on OSSEC and ELSA. In this video, you'll see how quickly you can configure OSSEC and ELSA using Security Onion. We'll then use the ELSA web interface to hunt through OSSEC alerts and all logs received from all OSSEC agents. Also note that you can send standard syslog to ELSA and query those logs as well.